Across most of sub-Saharan Africa, malaria is transmitted by mosquitoes from the Anopheles gambiae complex, comprising seven morphologically indistinguishable but behaviourally-diverse sibling species with ecologically-distinct environmental niches. Anopheles gambiae and An. arabiensis are the mostly widely distributed major malaria vectors within the complex, while An. quadriannulatus is sparsely distributed. Indoor residual spraying (IRS) with the organophosphate pirimiphos-methyl (PM) was conducted four times between 2011 and 2017 in the Luangwa Valley, south-east Zambia. Anopheles mosquitoes were repeatedly collected indoors by several experiments with various objectives conducted in this study area from 2010 onwards. Indoor mosquito collection methods included human landing catches, Centres for Disease Control and Prevention miniature light traps and back pack aspirators. Anopheles gambiae complex mosquitoes were morphologically identified to species level using taxonomic keys, and to molecular level by polymerase chain reaction. These multi-study data were collated so that time trends in the species composition of this complex could be assessed. The proportion of indoor An. gambiae complex accounted for by An. quadriannulatus declined from 95.1% to 69.7% following two application PM-IRS rounds with an emulsifiable concentrate formulation from 2011 to 2013, while insecticidal net utilisation remained consistently high throughout that period. This trend continued after two further rounds of PM-IRS with a longer-lasting capsule suspension formulation in 2015 and 2016/2017, following which An. quadriannulatus accounted for only 4.5% of the complex. During the same time interval there was a correspondingly steady rise in the proportional contribution of An. arabiensis to the complex, from 3.9 to 95.1%, while the contribution of nominate An. gambiae remained stable at ≤ 0.9%. It seems likely that An. arabiensis is not only more behaviourally resilient against IRS than An. gambiae, but also than An. quadriannulatus populations exhibiting indoor-feeding, human-feeding and nocturnal behaviours that are unusual for this species. Routine, programmatic entomological monitoring of dynamic vector population guilds will be critical to guide effective selection and deployment of vector control interventions, including supplementary measures to tackle persisting vectors of residual malaria transmission like An. arabiensis. World malaria cases have fallen from 271 million in 2000 to 212 million in 2015, a reduction of 22% and within the same time period the number of deaths has equally reduced from an estimated 830,000 in 2000 to 429,000 . Vector control interventions such as long-lasting insecticidal nets (LLINs) and indoor residual spraying (IRS) are responsible for most of these gains [1–3]. Malaria transmission in most parts of Africa is primarily sustained by mosquitoes from the An. gambiae complex and the An. funestus group. The An. gambiae complex is composed of seven cryptic sibling species, with An. gambiae and An. arabiensis being amongst the most efficient and broadly distributed malaria vectors [4–9]. The sibling species within this complex are morphologically indistinguishable, but reproductively isolated and behaviourally diverse, with ecologically distinct environmental niches distributed across sub-Saharan Africa [7, 10, 11]. For example, An. gambiae typically bites humans at night when they are sleeping and then rests indoors afterwards, so it is vulnerable to control with indoor interventions such as LLINs and IRS [12, 13]. An. arabiensis can also exhibit these same anthropophagic, endophagic behaviours, but is far more behaviourally plastic and can avoid such indoor interventions by feeding outdoors upon animals or upon people when they are unprotected . Furthermore, An. arabiensis can also feed indoors but then rapidly escape from houses through various openings such as eaves, to rest safely outdoors without fatal exposure to insecticides [15–19]. In contrast, An. quadriannulatus is another sibling species from this complex that has a more limited distribution in arid areas, where it mediates little  or no transmission. This species is usually not considered to be a vector of malaria because it typically feeds upon animals [21, 22] which do not carry Plasmodium parasite species capable of infecting humans. However, in the Luangwa Valley, south-east of Zambia, it was found in sympatry with An. gambiae and An. arabiensis, where it predominantly attacked humans indoors at night in far greater numbers than the other two sibling species [22–24]. Since those original characterizations of this unusual vector guild in south-east Zambia , IRS with the organophosphate pirimiphos-methyl (PM) was introduced and repeated over several years . Therefore, the overall goal of this retrospective observational study was to determine whether PM-IRS had any selective impact on the indoor species composition of the An. gambiae complex overtime. All the studies from which the sibling species composition data are presented here, were conducted and collated from Chisobe village, situated south-east of Lusaka, the capital city of Zambia. This area is characterised by having pyrethroid-resistant An. funestus as the major malaria vector responsible for malaria transmission [23, 25–27]. The Zambia National Malaria Elimination Programme initiated mass LLINs distribution campaigns in 2005 and this area was one of the first beneficiaries in 2005/2006 and again in 2008/2009 , as well as more recently through campaigns in 2013 and 2017. Additionally, IRS has been conducted in this setting from 2011 to 2013 with an emulsifiable concentrate formulation of pirimiphos-methyl (PM) (Actellic 50EC®, Syngenta AG, Cape Town, South Africa) that has relatively short-lived effectiveness [28, 29]. This was then followed by two IRS spray rounds with a longer lasting capsule suspension formulation of PM (Actellic 300CS®, Syngenta AG, Cape Town, South Africa) [30–32] in 2015 and 2016/2017. The species composition of the Anopheles gambiae complex of sibling species was evaluated as part of various studies with different objectives, conducted intermittently between 2010 and 2017. The first experiments in 2010 involved a 3 × 3 Latin Square design evaluation of three different sets of trapping methods in local houses with two blocks of three houses, with one group having LLINs alone while the other had a combination of LLINs and IRS with deltamethrine (K-Othrine WG250 Bayer Environmental Science, Johannesburg, South Africa). The first set of trapping methods consisted of human landing catches both indoors and outdoors, while the second had a CDC light trap indoors and the third had resting boxes placed indoors and outdoors. Each of the trapping methods were rotated through the three households over three consecutive nights, and this rotation schemes was repeated over 10 rounds of replication [24, 33]. In the subsequent studies in 2014, 2016 and 2017, four experimental huts of the Ifakara design [34, 35] were built in the same village and mosquitoes were collected indoors during evaluations of various IRS formulations, which were deployed as either their intended IRS format [34, 35] or treatments for window screens and eave baffles . Eight adult men were recruited to sleep in the huts overnight from 19:00 to 07:00 h and the two sleepers were assigned to a single specified hut for the duration of the experiments. All the sleepers slept under an intact LLIN (Permanet.2.0, Vestergaard Frandsen, Nairobi, Kenya without any holes. Every morning at 07:00 h, indoor resting mosquitoes were retrieved using back pack aspirators . In order to mitigate against sampling inconsistencies between the different collection methods used, only mosquitoes caught indoors were considered for this analysis of temporal trends in sibling species composition. All mosquitoes of the An. gambiae complex were initially morphologically identified to species level using various taxonomic keys  and recorded as unfed, partly fed, fed and gravid. Mosquitoes were then further processed to classify them to sibling species level by polymerase chain reaction (PCR) . In order to avoid any introduction of any sampling bias by selective impact of insecticidal active ingredients of the LLINs, IRS or treated window screens and eave baffles, data for all PCR-amplified specimens from the An. gambiae complex were included, regardless of whether they were alive or dead when collected, or which collections method they were obtained with. Additionally, enzyme-linked immunosorbent assay (ELISA) was used to detect sporozoites in the heads and thoraces of the 2016 samples only. The data was analysed using the open-source statistical software package R (3.2.1) to fit generalised linear models (GLMs) with a logistic link function and binomial error distribution. Fitted GLMs assessed the effect of time (continuous predictor) on the proportion of the An. gambiae complex accounted for by each of the three sibling species. From the 2010 indoor household experiments, a total of 1112 specimens of the An. gambiae complex were identified to species level by PCR. The proportional composition of these samples was dominated by An. quadriannulatus (95.2%) when compared to An. arabiensis (3.9%) and An. gambiae (0.9%). From the 2014 experiments, 218 specimens of the An. gambiae complex were identified to sibling species level. Anopheles quadriannulatus (69.7%) was still the most proportionally dominant species, but a much greater share was accounted for by An. arabiensis (30.3%). Out of 897 An. gambiae specimens identified to sibling species level in 2016, An. arabiensis (85.7%) was proportionally the most abundant, while An. quadriannulatus only accounted for a minor fraction of the complex (14.2%) and nominate An. gambiae remained very sparse (0.2%). In 2017, out of 285 specimens identified to species level, almost all were An. arabiensis (95.1%), with An. quadriannulatus (4.5%) and An. gambiae (0.4%) contributing only very minor fractions. The overall steady downward trend in the proportional contribution of An. quadriannulatus over the course of the study (Z = -21.1 P < 0.0001), and the corresponding upward trend for An. arabiensis (Z = -28.9, P < 0.0001), is presented graphically in the context of IRS rounds in Fig. 1. Only one sporozoite-positive An. arabiensis was identified out of 769 tested specimens from An. gambiae complex samples collected in 2016. The steady proportional decline of indoor biting An. quadriannulatus and corresponding rise of An. arabiensis may be attributed to PM-IRS, first with a short-lived formulation in 2011 and 2013, and then followed by a more effective, longer-lasting formulation which immediately achieved even greater impact on vector densities and human malaria infection burden . These observations add further evidence to support supplementing pyrethroid-treated LLINs with IRS using an alternative insecticide with a different mode of action from another chemical class . This can therefore effectively control indoor-feeding secondary vectors like this local An. quadriannulatus population which has been incriminated previously as a vector of residual transmission in this setting . On the other hand, the proportion of the An. gambiae complex accounted for An. arabiensis correspondingly increased over the same time period. It is highly unlikely that between-species differences of insecticide susceptibility could explain these observed shifts in species complex composition, because no resistance to PM has been documented to date within the An. gambiae complex anywhere in Zambia (NMEC, personal comms). The increased relative abundance of An. arabiensis may therefore have arisen from the known behavioural resilience of this species, which evades contact with insecticides by feeding on animals (zoophagic), feeding outdoors (exophagic), resting outdoors (exophilic) and expressing early-exiting behaviours that make it less vulnerable to IRS or LLINs [14, 18]. In this particular case, zoophagy seems an unlikely contributor to the preferential survival and increasing dominance of An. 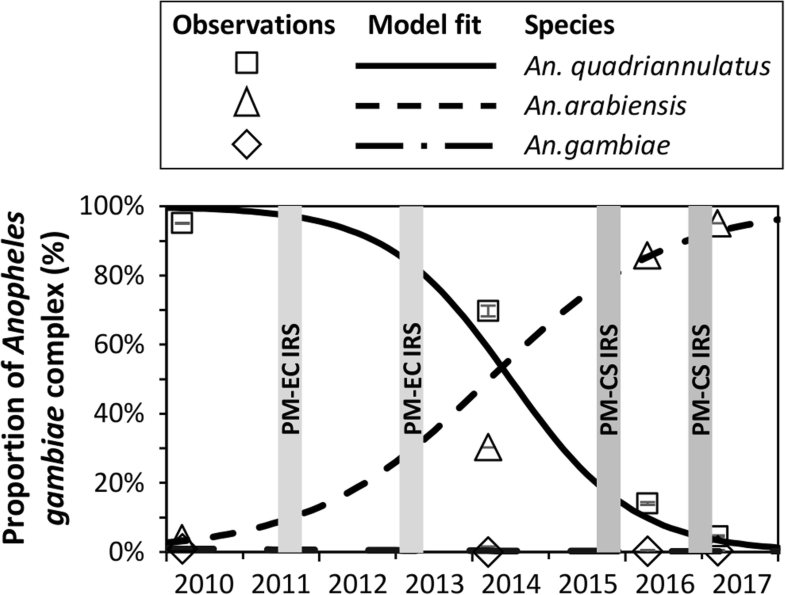 arabiensis over time, because the previously dominant species was the even more zoophagic An. quadriannulatus, rather than anthropophagic An. gambiae. Furthermore, while behavioural characterizations in this study site in 2011 and 2012 confirm that the local An. quadriannulatus population is indeed strongly zoophagic, these same experiments reveal an unusually strong preference for humans amongst An. arabiensis, which completely ignored cattle and goats when offered a choice between these three different sources of blood . However, some populations of An. arabiensis can feed early in the evening when many people are active outdoors, where they are not protected by either LLINs or IRS. Secondly, An. arabiensis consistently suffer much lower mortality than either An. gambiae or An. funestus inside huts containing LLINs or IRS, even with insecticides to which they are completely susceptible [13, 39, 40], apparently because they forage far more briefly and cautiously within houses and then exit before they are fatally exposed [41–43]. While IRS clearly must have reduced An. quadriannulatus population densities indoors, and could have reduced inter-specific competition within the taxon sufficiently to enable genuine species replacement in the strict sense [44, 45]. However, the data presented here only represent proportions from within samples of varying size collected with varying methods on an intermittent basis, so it is not possible to unambiguously conclude that the densities of An. arabiensis increased in absolute rather than relative terms. The shifting proportional balance of these two species could be readily explained by a simple reduction in the number of An. quadriannulatus biting indoors, even without any corresponding increase in An. arabiensis densities. However, it is not possible to distinguish between simple selective suppression of some species more than others [18, 46] versus true population replacement  without consistent, year-round longitudinal density measurements using fixed trapping over the full course of the period in question. Nevertheless, to the best of our knowledge this is the first report demonstrating the proportional decline of indoor-biting An. quadriannulatus of probably modest vectorial capacity, specifically associated with a corresponding steady rise of An. arabiensis, which is known to be widely important vector of residual malaria transmission across many parts of Africa [19, 42, 43]. These observations are therefore potentially important from an epidemiological and vector control perspective, especially if An. arabiensis has replaced An. quadriannulatus in the strict sense, and does prove to be a more efficient malaria vector. As many vector control programmes re-orient themselves from malaria control to elimination, improved and novel control tools that specifically target behaviourally-evasive vectors like An. arabiensis should be considered as potential supplements to IRS and LLINs . Emerging new approaches, such as insecticide vapour emanators, attractive toxic sugar baits and mosquito-proofed housing  should be prioritised for evaluation as possible ways to tackle residual malaria transmission of behaviourally-resilient vectors like An. arabiensis. Of course, a retrospective observational study such as this has many limitations, notably the inconsistent and intermittent way in which mosquitoes were captured. Also, the houses and experimental huts in which they were captured varied in terms of whether their occupants used pyrethroid-treated LLINs, and whether they had been sprayed with PM. Unfortunately, it was not possible to link the molecular species identity results back to structure identity and records for the presence of LLINs or IRS treatments, so the repellent, irritant and insecticidal properties of these insecticidal measures may have affected species composition by differentially influencing the behaviour and survival of distinct sibling species. Other limitations include non-availability of data on of blood meal sources, while sporozoite rates were only assessed for the 2016 samples, with only one infected An. arabiensis specimen identified, so this collation of retrospective data cannot be used to infer any temporal change in sporozoite prevalence or malaria transmission. These kinds of inconsistencies are typical of such opportunistic secondary analyses of data collected with project-based research funding, because the diversity of experiments from which data were collated were originally designed to address a range of very different, loosely-related questions . Also, these observations come from only one village in the Luangwa valley and cannot be considered representative of national or even provincial-level trends. Programmatically-funded and managed surveillance platforms are clearly required in Zambia and most other tropical countries for sustained, consistent longitudinal monitoring of mosquito population dynamics , as well as the behavioural and insecticide resistance traits that drive these trends [18, 47]. Furthermore, it will be important to quantify how much An. arabiensis and other persisting vectors contribute to residual malaria transmission, and to unambiguously determine whether genuine population replacement  of previously abundant vectors like An. quadriannulatus has actually occurred. Despite these study limitations, this study yields insights that further reinforces the case for establishing continuous and rigorous entomological surveillance, so as to monitor vector species abundance and composition indefinitely over time. Additionally, surveillance will be critical in order identify which vectors are contributing to residual transmission in areas with high coverage of LLINs and IRS. This will enable malaria vector control programmes to rationally deploy improved and/or novel vector control tools to specifically target vectors like An. arabiensis which respond poorly to control with LLINs or IRS. We would like to thank the study volunteers in Chisobe village for having participated in all the experiments and the Luangwa District Health Management team for their support. The 2016 and 2017 experimental hut studies were funded by a Wellcome Trust Masters Training Fellowship awarded to DC (Award number 103271/Z/13/Z). The 2010 and 2014 experiments were funded by the Bill & Melinda Gates Foundation through the Malaria Transmission Consortium (Award number 45114). The datasets used and/or analysed during the present study will be made available by the corresponding author upon reasonable request. DC, CHS, GFK conceived the idea and wrote the first draft manuscript, BH and EC contributed to the manuscript, DRK carried out all molecular analyses and contributed to writing the manuscript. All authors read and approved the final manuscript. All participants in these studies were recruited through a documented informed consent process. For the 2010 indoor collection studies, ethical approval was granted by the National Ethics Committee of the University of Zambia (IRB00001131 of I0RG0000774) and the Research Ethics Committee of the Liverpool School of Tropical Medicine (Approval 09.60). All subsequent studies were approved by ERES Converge IRB Zambia (Reference 2015.003) and the Liverpool School of Tropical Medicine (Reference 15.044).